The long-awaited formation of the authorities in the Federation of Bosnia and Herzegovina (FBiH) was supposed to lead to a breakthrough in the five-month long political stalemate in Bosnia and Herzegovina (BiH) but instead could be a reason for even greater tension between the three constitutive ethnic groups and for a delay of the formation of state-level authorities. The upper house of FBiH parliament has been constituted on March 17th with 33 delegates having been sworn in. Parliamentary representatives of the two main parties of the Croats - HDZ (Croatian Democratic Union)-BiH and HDZ-1990 boycotted the parliamentary session. They claimed it was illegitimate as delegates from three Croat-dominated cantons are yet to be elected in the House of Peoples. That way, in the absence of the two parties, the two chambers of parliament proceeded to elect a president, vice-presidents and a new government of the largest BiH entity (the other one is Republika Srpska), despite the warning from the Central Electoral Commission (CIK) that the process of parliament formation is not over. The new authorities were set up by four parties - the two main at federal level - Social Democratic Party (SDP) and the Party of Democratic Action (SDA) and two smaller parties - Croatian Party of Rights (HSP) and the Prosperity Through Work party (NSRzB), after no agreement had been reached with the two HDZs on the distribution of ministerial seats both at an entity and central level. Croat Zivko Budimir from HSP was elected as new FBiH president while Bosniak Mirsad Kebo from SDA and Serb Svetozar Pudaric from SDP - as his deputies. Nermin Nikcic from SDP was appointed as the entity's new prime minister to lead the 16-member government. The cabinet consists of seven SDP representatives, five from SDA and two from HSP and NSRzB each. The move of the four-party coalition was slammed by the two main parties of the Croats who said that the new authorities without their representatives were not legitimate. 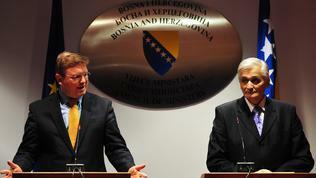 HDZ-BiH leader Dragan Covic stated that calling of new elections is the only way out of the situation. President of HDZ-1990 Bozo Ljubic in his turn said that BiH faces the most serious crisis since the war and the situation should not be underestimated. He warned against attempts to ignore the will of the Bosnian Croats. Outgoing FBiH President Borjana Kristo brought the issue to the Constitutional Court and CIK asking for an opinion on the legality of the parliamentary session. Croat members of the cabinet threatened not to hand over their duties to their successors. The leader of Bosnian Serbs, Milorad Dodik, voiced support for the two HDZs which could further complicate the formation of the state-level authorities. Chairman of Bosnian Presidency Nebojsa Radmanovic also said that formation of FBiH authorities without the two parties represents a danger not only for the federation but also for BiH. He put into doubt the right of the SDP, which represents itself as multiethnic party, to appoint representatives of the three constitutive peoples on key positions. The failure of political leaders to reach an agreement on the distribution of power after the October parliamentary elections caused concern among the international community. 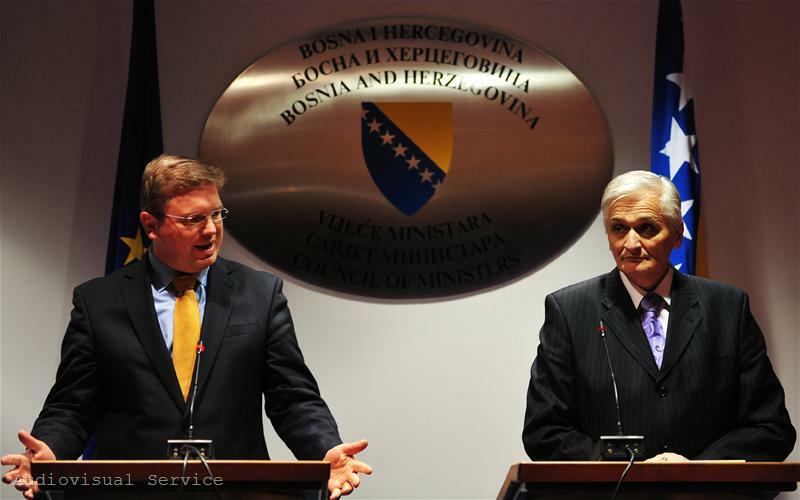 The situation in BiH was discussed during the March 21st meeting of EU foreign ministers. In the conclusions of the Foreign Affairs Council held in Brussels they voiced deep concern that governments have not yet been formed at all levels. The council urged the political leaders in the country to engage responsibly and in a spirit of compromise to find a solution to government formation at all levels in order to address urgent and necessary reforms. About a week ago EU foreign policy chief Catherine Ashton and EU Enlargement Commissioner Stefan Fule warned in a joint statement that lack of progress in the formation of governing bodies in BiH was a serious problem. The two officials called on the country's leaders to overcome their disagreements.